This weeks meal was a simple crustless quiche, made with eggs, milk, cheddar, and onions. It felt a bit odd to make a quiche without packing it full of veggies like I usually do, but quiche-friendly veggies are getting scarce by now. 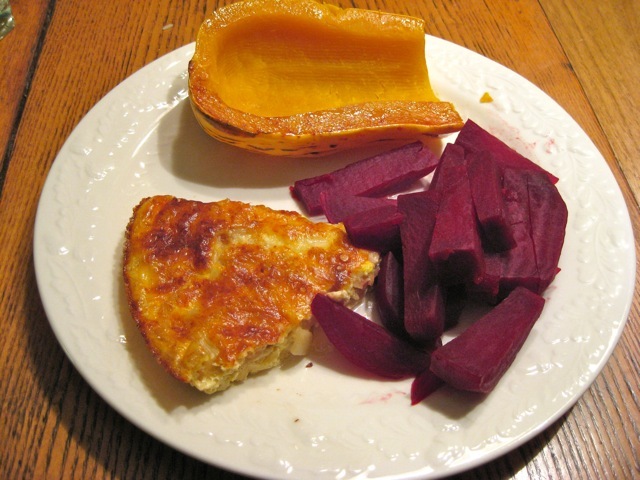 I made baked delicata squash and steamed beets on the side. 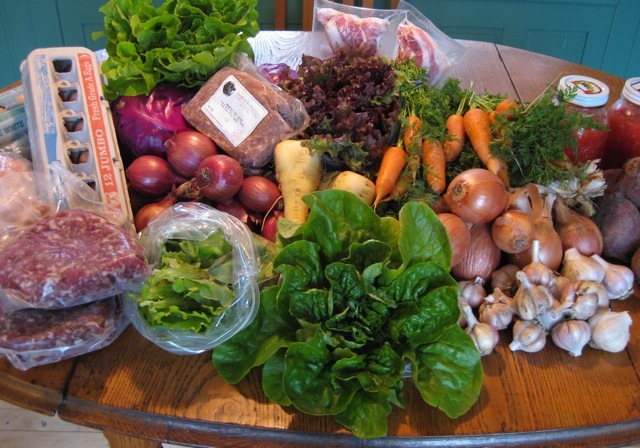 At one of the first Lyndon winter farmer’s markets this year, there was a new vendor from a farm in New Hampshire (Meadowstone Farm in Bethlehem, to be specific) selling veggies, pork, and chickens. I was poking around in his chicken cooler, and he told me he had some old layers that he was selling for fifty cents a pound. What?? I was sure I hadn’t heard right. I’m used to paying three bucks a pound for free-range or pastured chicken. He was selling a 5-lb bird for just $2.50! The hen sat in our freezer for a couple of months. I hadn’t stewed an old hen since we got rid of our layers a few years ago, so I looked online for instructions. Over and over again, recipes for coq au vin popped up. I’m a lazy cook and rarely follow a recipe to the letter, so I heavily adapted the coq au vin recipes I found. One thing that went straight out: setting anything on fire. Some of the recipes called for pouring cognac or brandy in the pot and setting it alight. No thanks! I didn’t want a grease fire on my hands. I’m happy to leave those advanced techniques to a braver cook than I. Most recipes called for starting out by frying up some bacon. Bacon is considered a highly desirable delicacy in my household, and I was reluctant to use up any of our precious reserves. I used bacon fat instead. I cut the hen into pieces and browned them with onion, garlic, carrots and parsnips. Coq au vin usually calls for mushrooms, but unfortunately, I’m the only person in my family who likes mushrooms, so I used the other veggies instead. When everything was nicely browned, I added red wine, turkey broth (I happened to have a turkey carcass simmering on the stove from a late Christmas celebration), and some herbs. I put the whole shebang in the oven at 275 degrees. Two hours later, the meat was still pretty tough, so I decided to save it for the next day’s dinner. After a couple more hours in a slow oven, the chicken was tender and delicious. 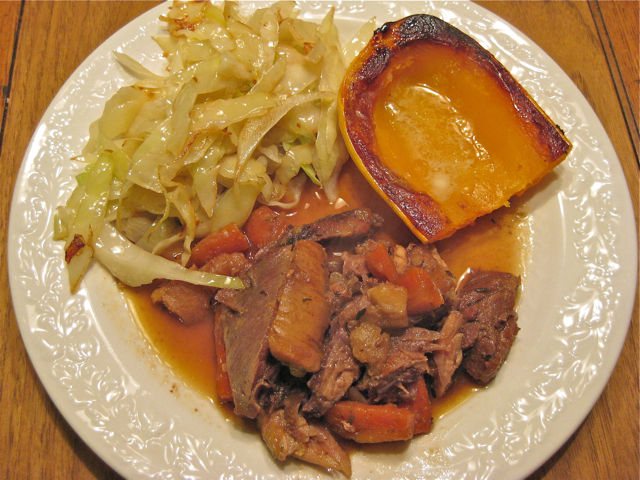 We ate it with cabbage sautéed in butter and baked delicata squash. I must say, the chicken was one of the best I’ve ever had – moist, tender, and oh-so-flavorful. I licked my plate and my husband’s too! 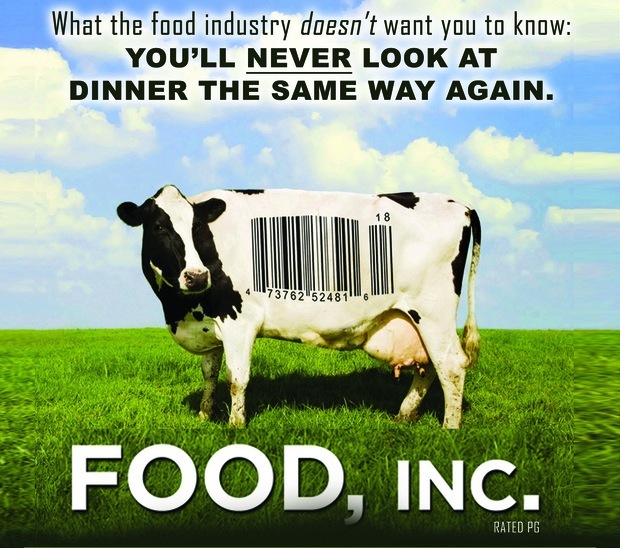 Have you seen Food, Inc. yet? It’s absolutely worth seeing. It’s eye-opening, horrifying, and inspiring all at the same time. If you missed it when it was in theaters, don’t fret – you have another chance to see it on the big screen. Come for a screening of the film with a discussion to follow: Saturday, January 30th at 8 PM in the Alexander Twilight Theater at Lyndon State College. Featuring interviews with such experts as Eric Schlosser (Fast Food Nation), Michael Pollan (The Omnivore’s Dilemma,In Defense of Food: An Eater’s Manifesto) along with forward thinking social entrepreneurs like Stonyfield’s Gary Hirshberg and Polyface Farms’ Joel Salatin, Food, Inc. reveals surprising—and often shocking truths—about what we eat, how it’s produced, who we have become as a nation and where we are going from here. See what is really happening in the food industry, and what you can do to protect yourself from the dangers of “cheap” food. You can’t afford to miss seeing FOOD, INC. Co-sponsored by Northeast Organic Farmers’ Association (NOFA), Rural Vermont, Lyndon State College, Stonyfield Farm, and Organic Valley. I missed a week of the Dark Days Challenge over the holidays. But never fear – I’m back, and better than ever! The good news: my all-local meal was made up almost entirely of items available at this Saturday’s winter farmer’s market! 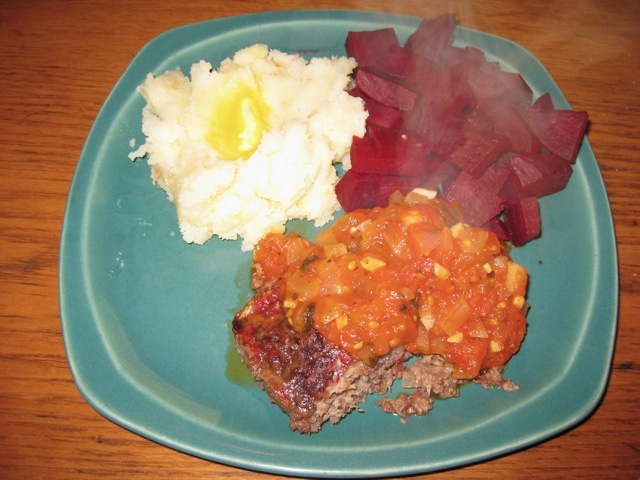 The bad news: it was meatloaf, again. A repeat main course, so early in the challenge. Oh well – it sure tasted good. 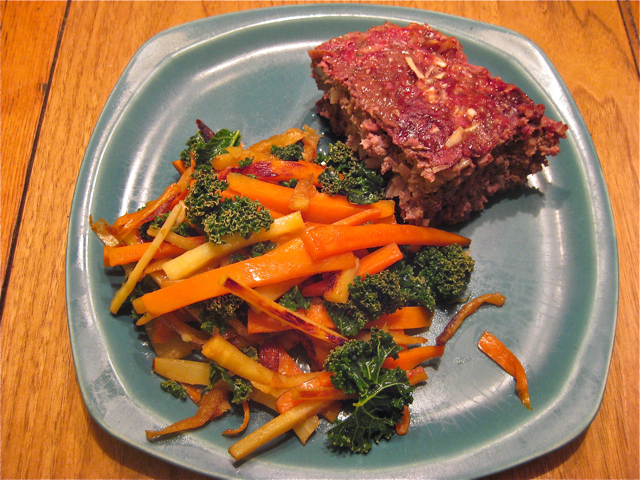 Alongside the meatloaf was maple-glazed root vegetables, which I found a recipe for on one of my favorite food blogs, The Nourished Kitchen. We altered the recipe a bit by reducing the maple syrup by half and adding some kale. Although we used a few ingredients we had on hand already, we could have gotten everything for our dinner except butter and (surprisingly) maple syrup at the farmer’s market. This week’s all-local meal consisted of braised lamb shanks with carrots, onions, and garlic. The lamb turned out mouth-wateringly tender – so good! 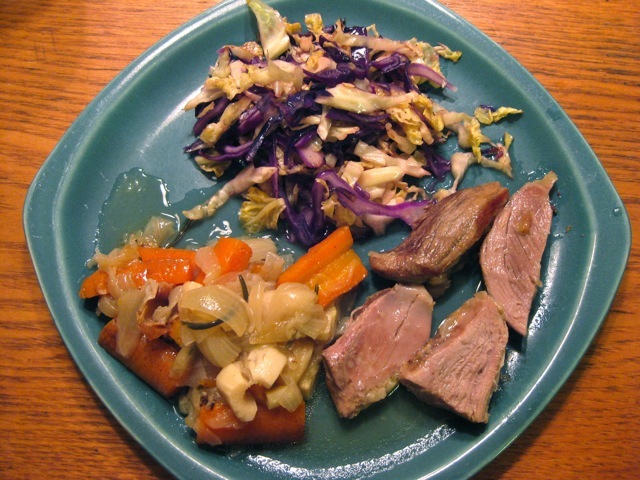 I sautéed red and green cabbage in butter to go with it. We eat a lot of red cabbage, but usually have it raw in salad or in a stir-fry; sautéing by itself it was new for us, and it was delicious. The lamb was from Hope Farm in East Charleston. The veggies were all from various farmer’s market vendors. Everything except salt, pepper, and spices came from within 30-odd miles. This blog has been dreadfully neglected for the past couple of months. I have been busy with other things, and have not been keeping up with the localvore blogosphere as much as I used to. Therefore, I missed the kick-off of the 3rd Annual Dark Days of Winter Eat Local Challenge. Never fear – this does not mean I have been eating a packaged-food diet! On the contrary, eating local has become such an ingrained habit for us that nearly all our meals consist largely of local food, almost always produced less than 30 miles from our house. This week’s meal featured classic comfort food. My husband made a fantastic meatloaf, made with pork sausage, ground beef, onions, garlic, eggs, and spices. I made spaghetti sauce to top it from canned tomatoes, onions, garlic, and herbs. We also had potatoes mashed with butter and cream, and steamed beets. The sausage and all the veggies (including the canned tomatoes) came from the farmer’s market, except the potatoes, which we grew ourselves. The beef, the eggs, and the cream for the potatoes are from Tamarlane Farm, the the wonderful place that supplies us with raw milk as well as beef, eggs, chickens, and turkeys. Non-local exceptions included olive oil, spices, and butter (I can buy local butter, but not organic local butter, and I believe that when eating foods rich in animal fats, it’s important to choose those which are produced with as few chemicals as possible). Many thanks to the dedicated farmers who provided us with this delicious food: Tamarlane Farm, the Wardens, Chandler Pond Farm, County Road Farm, and Harvest Hill Farm. How great is this? I went to two (count ’em, two) farmer’s markets today. If I wanted to go to a farmer’s market during the winter two years ago, I had to drive an hour and a half to Montpelier. Last year, a winter market started up in Lyndonville, but the veggie selection was mighty thin. The vendors found out that there was a demand, and geared up accordingly this year. Now there is a market in Lyndonville, plus a new one in St. Johnsbury! Unfortunately, due to a scheduling snafu, both markets were held on the first Saturday of the month. But never fear: starting in January, the St. J market will be held on the first Saturday, while the Lyndonville one will be on the second (full schedules are on the Farmer’s Markets page). Chicken, sausage, bacon, eggs, four kinds of lettuce, garlic, carrots, onions (yellow and red), beets, parsnips, cabbages, and canned tomatoes!